Last week, we looked at the study on detergent and this week, we’re focusing on bathing (video on Baby Bath Basics). We know that soaps are to be avoided as it is drying to the skin and adjusts the skin pH to more alkaline than it should be. 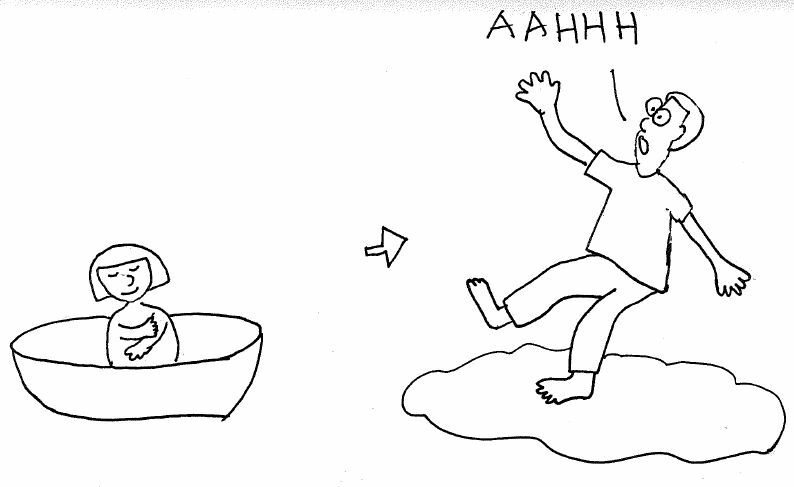 You also know that I use bath oil for my daughter Marcie, including a cartoon below on care after the bath! But does bath oil really help dry skin (xerosis) and eczema? This study in Norway examines that, let’s take a look at it! We use bath oil, instead of soap for shower; A few times, we slipped cos the floor is really bath oily! Study objective: Assess if xerosis, and possibly eczema, could be reduced at six months of age by early introduction of frequent oil baths/facial fat cream in infants with dry skin. Study method: 56 six-week-old infants with xerosis (dry skin), but not eczema, are separated into 2 groups – one using bath oil frequently (up to 7xs/week) and moisturizer on face, while not the other (sparse use). The skin outcome is measured at 6-month old. What’s Bath Oil to do with Baby Skincare? The observation is that for babies with eczema, the onset of their eczema (45% of eczema kids have eczema in first 6 months of age) is characterised by altered skin barrier, increased water loss and defective lipid layer. Bath oil retains the moisture on skin. 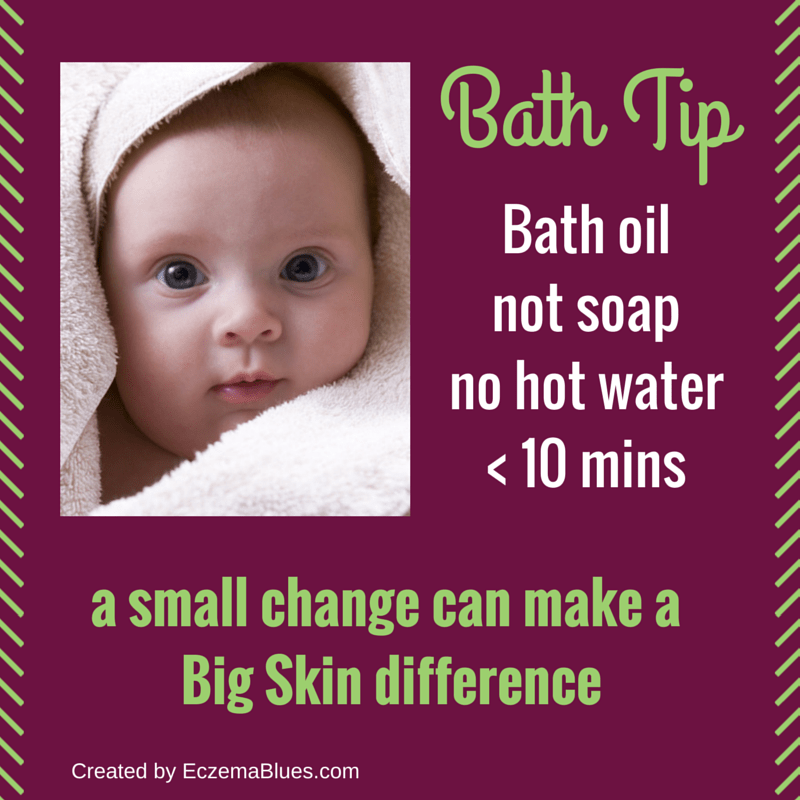 Moisturizers and bath oil are often part of eczema skincare but can it have preventive effect? Xerosis (dry skin) is a common feature of AE.. The abnormalities found in the stratum corneum involve increased water loss through the skin and reduction in total skin surface lipid. Normal desquamation of the stratum corneum depends on pH dependent proteases with normal function at low pH. Elevated pH of the stratum corneum increases serine protease activity, with secondary generation of inflammatory cytokines and reduced activity of lipid-processing enzymes, resulting in a defective lipid layer. A Western lifestyle with excessive use of soap and water and skin care products may change the pH of the skin surface in addition to changing the hydration of the skin, thereby influencing the barrier function of the skin. Skin pH is one of the many factors leading to defective skin. Do read Dr Cheryl Eberting’s series on skin pH. In the post I did with Professor Hugo in 2011, it is mentioned that the lack of filaggrin gene also increases the skin pH and leads to increased skin inflammation. (fyi: elevated skin pH, increasing skin pH = more alkaline than the skin should be, one of the reason why soap is never recommended for dry skin as it’s alkaline – we want the skin to be slightly acidic). Conclusion: The intervention group had more often normal skin (75%) at six months than the observation group (37.5%), and less often probable atopic eczema. No adverse reactions were reported. My take: I do use oatmeal-based bath oil on alternate day. Now that my child is at preschooler age, we no longer soak her in the bath tub but just apply and rinse like normal bath lotion. What’s your take? Do you have a few seconds to drop a comment and share? Most cases of eczema in children can be treated at home. However, children are at an increased risk for skin infections. Eczema creates the uncontrollable urge to itch. Your child may continue scratching until the skin is broken, leaving an open wound. Children will be children and that means coming into contact with many germs and bacteria. Combine these with an open wound and there is an increased risk for a skin infection. Treat your child’s eczema at home, but seek medical attention if you suspect the onset of infection.